How wonderful! These tropical green beauties are found self-sown in every nook and corner, sort of. Like the Torenia fournieri and other ferns, they’re seen growing on mossy bricks, sharing ground or pot spaces, on crevices of walls and pavement, along the sides of drain and even sprouting from the drainage holes of standing or hanging pots. Botanical Name: Adiantum latifolium Lam. (syn. : Adiantum fovearum Raddi, Adiantum lucidum var. bipinnatum). Etymology: The genus name, Adiantum is the Greek word adiantoj, meaning unwetted and referring to the water-repellent fronds. The species epithet latifolium means having broad leaves/fronds. Origin: Native to tropical Southern Mexico in Northern America and from the Caribbean, Mesoamerica, Venezuela and down to Brazil, Argentina and Paraguay in Southern America. 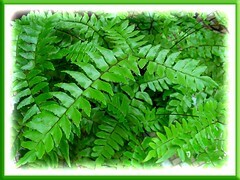 Plant type: A perennial landscape fern. Light: Part-shade to full shade with preference to bright indirect light or filtered sunlight. Intolerant to full sun that will scorch its leaves. Moisture: Lots of water regularly and requires high humidity. Soil: Light and loamy soil, moist as well as well-drained. Propagation: Easily by crown division. Firstly, trim off to almost ground level most of the older rachises and remove withered fronds. Then dig it up and divide the rhizome by cutting through with a garden spade or sharp long-edged knife and finally replant the divisions into individual pots, being careful not to plant their crown below soil level, as it is from this point that new fronds will emerge. Broadleaf Maidenhair can also be propagated from spores. Collect the ripe spores from under spore-bearing pinnules (leaflets) and sow on the surface of a humus-rich sterilized soil. Keep the growing medium always moist by covering with a plastic bag over the pot. Germination should take place within 6 weeks at a temperature of 68-70 degrees F, then transplant the tiny clumps of plantlets where desired. Here’s an interesting article by the Australian National Botanic Garden on fern propagation from spores that included the fern life cycle as well. Features: Adiantum latifolium has a long-creeping rhizome, and is an evergreen fern, growing to a height of 1-2 feet tall and creeps as wide. 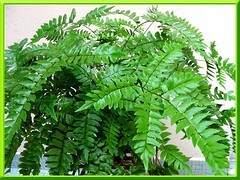 Quite a hardy fern with slender and wiry stipes and rachises that are 6-15 inches long, erect (or drooping with age), shiny and brownish-black or almost black in color. Displaying luxuriant green foliage of graceful arching fronds 12-24 inches long, with a central pinna 4-8 inches long, and two to four more slightly shorter pinna on each side. An attractive formation with each pinna holding green glossy pinnules (leaflets) that are trapezoid-like (diamond) in shape with an oblique outer side, and measures 1-2 inches long and 0.5-0.75 inch broad, with 2 margins smooth and 2 margins bluntly lobed by the numerous spores on the underside. 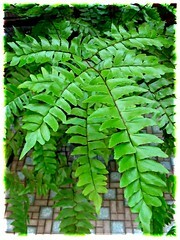 Care: Adiantum latifolium is such an easy-to-grow and easy-to-care fern. Much depends on where it’s situated and moisture received. For optimum growth, position it in part shade or where it can receive dappled sunlight, warmth and humidity. Soil should be kept constantly moist, to prevent its pinnules from drying up, not overly wet though. To maintain a humid environment in non-tropical regions, mist the foliage regularly or place indoor potted plants on pebbles in a saucer filled with water, with the pot bottom above the water. Pluck off dead stems to keep it tidy and repot every one to two years to revitalize soil and increase growth rate. Fertilize once monthly with a soluble fertilizer during the growing season. Hardly affected by diseases or pests like aphid, scale or mealybugs. Usage: This Broadleaf Maidenhair is very ideal as ground cover in garden beds or borders, as well as suitable in shady or woodland garden. Excellent for container gardening, be it indoors or outdoors. It’ll look fabulous in hanging baskets too with a mix of both erect and cascading fronds. Can also be used as a filler foliage in floral arrangements. For sub-tropical & temperate regions: Cold hardiness: USDA Zone 10-11. Requires temperatures between 60-86 degrees F (15-30 degrees C) and less water in winter. Some other ferns growing in our garden are the Adiantum capillus-veneris and Pteris ensiformis cv. Evergemiensis. 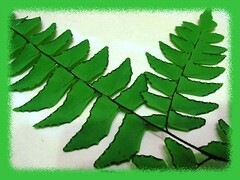 And, do enjoy a photo gallery of Adiantum (Maidenhair) ferns at Gymnosperms.org. I am looking to buy Adiantum trapeziforme. Do you have any to sell or know where I can get some in the US? Thanks. Sorry, but this fern featured is not Adiantum trapeziforme. In fact it is not an Adiantum (genus). Are you doubly sure about it not being A. trapeziforme, Jorn m? We’d appreciate if you can share your reasons or basis for stating thus. Would you by any chance know the correct ID for our fern? Thanks.